This was a simple dish I found in Deborah Madison's Vegetarian Cooking For Everyone when we needed a side dish, had some cauliflower from the farmer's market and not much time to devote to it. Mortar and pestle used for the mustard butter - garlic, shallots, salt, mustard, and butter. Cauliflower mixed with the butter. Prepare the cauliflower by cutting the head into florets. Prepare a saucepan with a steamer by bringing water in the pan to a boil and putting the florets into the steamer. Steam until tender, about 5-7 minutes. Meanwhile add the garlic clove, shallots, and salt into a mortar, pounding until a paste. Add mustard to combine then add the butter, pounding and mixing everything until completely mixed. Save about 1/4 cup of the flavored butter for the cauliflower then store the remainder by rolling into a cylinder, wrapping with wax paper and freezing for later use. Once frozen you can add to various dishes, best used for other vegetables of the cabbage family like broccoli, Brussels sprouts, kale, chard, etc, by slicing into disks and adding to the cooked vegetable. For the cauliflower, add the butter while still hot just prior to serving. This dish has become one of my comfort meals based on a recipe in Marcella Hazan's Essentials of Italian Cooking. For many it has a fairly strong flavor but I am in love with it, I'm just happy that my wife likes it too. It seems to have the same origin as the tuna pasta I blogged about a while back but has a much more robust flavor with considerably more depth but takes a bit more work to pull off. Although cultured fennel from a market would work in this dish I'm lucky enough to have a stubborn wild fennel growing in my yard that I can use which I prefer since the fronds tend to have more flavor than the store-bought ones. 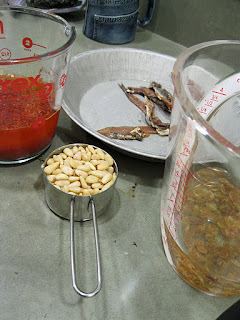 Tomato-saffron sauce, pine nuts, salt-packed anchovies, golden raisins soaking. Beautiful fresh sardines born in the Monterey Bay. Fennel added to the onions. Now with the sardines added. Whole wheat bread pulsed in the food processor into crumbs for a topping. Finishing the pasta in the pan with the sauce. The final dish served with a green salad. Prepare the sardines and fillet them. 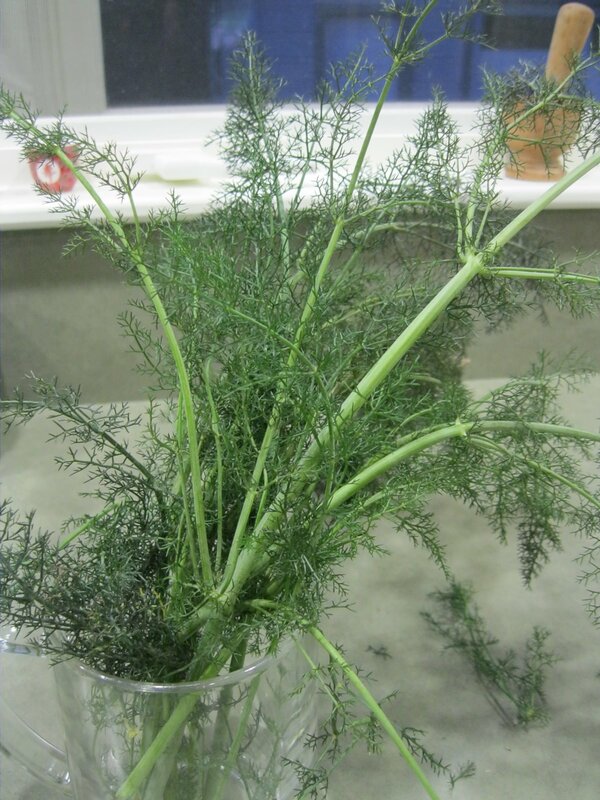 Wash the fennel fronds in cold water and add to a large partially covered pot of boiling water to cook for about 10 minutes. Remove the cooked fennel and set aside reserving the pot of water to cook the pasta. Once cool, squeeze the water from the fennel then chop to add to the sauce later. Soak the raisins in cold water for 15 minutes then drain and chop. Wash, fillet, and dry the anchovies in a paper towel. Heat a medium (12") skillet over medium heat and add the olive oil. Once hot, add the diced onion to saute until translucent. Add the anchovies and use a wooden spoon to crush them combining them with the onion in the skillet, then add the chopped fennel to cook for about 5 minutes. Clear the middle of skillet and add half of the filleted sardines to cook about 1 minute per side. When done, move them to the perimeters of the skillet with the fennel/onion/anchovy mix and add the remainder of the sardines, again about 1 minute per side. Once the sardines are done, add the pine nuts, chopped raisins, tomato/saffron solution, salt and pepper to skillet to completely combine and heat as a sauce. Boil the pasta in the fennel water to a minute short of the instructions on the package, drain, then add to the sauce to finish for the final minute of cooking. Add the bread crumbs and combine just prior to serving. This was a Christmas breakfast I cooked for my wife this year. She usually makes the weekend breakfasts in the house so I thought it'd be a nice gesture to treat her to one for a change. I found this in my most recent favorite cooking publication, Saveur magazine, and used most of it for these two recipes. The first recipe is for scones. As this was really the first time I'd made scones I found out that it's best to refrain from kneading the dough too much. Problem was that it was an extremely dry day here and by the time I realized the dough required considerably more liquid than the recipe called for, I'd already worked the dough quite a bit trying to get it together. The second recipe is for the eggs. We didn't have real ramekins so I used small glass oven safe bowls instead which worked fine as a substitute. The cream used to cook the chanterelles lent a really nice texture in addition to the flavor of the overall dish. I followed the recipe for 4 dishes but 2 would easily suffice for 2 people. The leftover eggs heated up well the next day using the same procedure heating the bowls in a pan with boiling water in the oven. Preheat oven to 400°. Line two baking sheets with parchment paper and set aside. Whisk flour, sugar, and baking powder together in a large mixing bowl. Using a pastry cutter or two table knives, cut butter into flour mixture until it resembles coarse meal flecked with pea-size pieces of butter. Stir in sultanas. Add milk and stir until dough just comes together. Divide dough into 20 equal pieces, gently shape each into rounds, and arrange on prepared baking sheets 1"–2" apart. Beat egg and 1 tsp. water together in a small bowl. Using a pastry brush, brush tops of dough rounds with egg wash.
Bake scones until golden brown, 30–35 minutes. Set aside to cool on wire racks for 5–10 minutes. Serve warm with butter and marmalade or jam. Make the garlic conﬁt: heat oil in a small saucepan over medium-low heat. Add 2 cloves garlic and cook, stirring occasionally, until garlic is tender, 15–20 minutes. Using a slotted spoon, transfer garlic to a cutting board; let cool. Thinly slice garlic conﬁt lengthwise. You can reserve the oil for another use, such as making vinaigrettes or poaching ﬁsh. Poke the remaining garlic clove with the tines of a fork and set aside. Melt 2 tablespoons of the butter in a 12" skillet over medium heat until foamy. Add spinach and cook, stirring occasionally with fork used to poke the garlic (to perfume the spinach), until tender, about 6 minutes. Season with salt and pepper. Transfer spinach to center of a tea towel and wipe out skillet. Gather up ends of towel and squeeze out excess liquid; set spinach aside. Melt the remaining butter in skillet over medium heat. Add remaining garlic clove and mushrooms, season with salt and pepper, and cook, stirring occasionally, for 5 minutes. Add heavy cream and cook 5 minutes more. Remove pan from heat, cover, and let mushrooms steep for 15 minutes. Discard garlic. Heat oven to 400°. Divide the spinach and mushroom mixture between four 6 ounce ramekins. Add reserved slices of garlic conﬁt. Crack 1 egg into each ramekin. Transfer ramekins to a 9" x 13" baking pan and pour enough boiling water into pan to come halfway up the side of the ramekins. Cover pan with aluminum foil and transfer to oven; cook until whites are set and yolks are still runny, about 10 minutes. To serve, arrange ramekins on 4 plates, and season the eggs with salt and pepper.